I've been up to my neck in it at LogLogic as we get a new website, blog and version 3 launched. Sorry for the lack of posts. It's been a major undertaking and we're thrilled with the results. The team at RD2 did a terrific job - a tireless and extremely talented bunch. We've done some interesting things with the site and blog. First, we housed the blog as an element of the overall loglogic.com architecture. This enables blog content to be searched and presented alongside the broader site content. Second, we're using MoveableType to power large elements of the site. This will make the site a lot more self serve. Third, we automated much of the functionality - integrating the blog feeds and site. So, you post the blog and it automatically appears on the loglogic.com home page. Finally, we've added RSS for everything from news releases through job opportunities. We've got much more to do and it has been a really interesting project so far. The bottom-line is that building a web site with participatory functionality makes for a much more powerful experience. Let me know what you think. Yahoo! News is now delivering blogs as a component of a news search result. This has major implications for PR practitioners. Suddenly those searching for news on your product get a feel for what users, the community, and the pundits are saying - unfiltered. It has equally major implications for blogging. It enables anyone with the energy and enthusiasm for a particular topic to potentially sit on the front page right alongside traditional news sources. If PR people hadn't woken up to the voice of bloggers, they now need to wake up to their reach as well. Here is an example. Yesterday I blogged on NetNewsWire's acquisition by NewsGator. I searched for NetNewsWire using Yahoo! News. To the left you can see traditional news media covering the story. To the right you can see my post from yesterday. The other question this poses is that is this the beginning of the end for blog search engines? While I'm still keen on many of the blog search engines, most remain incredibly frustrating for users. While some are giving up on them due to search quality, most of the calls I get are related to usability and sheer frustration. I wonder why Google can't provide a version of Google News that incorporates blog content. Or, a version that triangulates the major blog content from across the web. Google Blog for instance. Yahoo might beat them to the punch. Put simply, as numbers get smaller, percentages grow bigger. That means when your 0.4 rating becomes a 0.6, viewership has "soared" 50%, even if that shift practically falls within a statistical margin of error, or could represent a couple of people with Nielsen meters ordering take-out pizza instead of going to dinner. Granted, if most reporters were adept at math, we'd have more respectable jobs, but even Stephen Hawking might be struck dumb by some modern press releases, which slice and dice ratings with the skill of a sushi chef. Acquisition of NetNewsWire strengthens NewsGators RSS Platform and extends it to the Mac esktop, Brent Simmons joins NewsGator team. 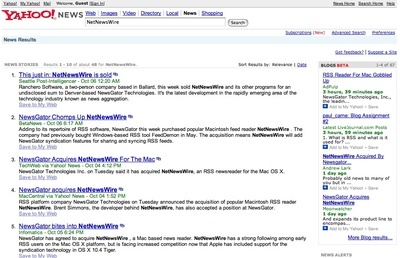 Denver, CO  October 4, 2005  NewsGator Technologies, Inc., the leading RSS platform company, announced today that it has acquired NetNewsWire, the leading RSS reader for Mac OS X. NewsGator also announced that NetNewsWire will integrate tightly with the NewsGator Online synchronization platform. Brent Simmons, the creator of NetNewsWire, will be joining the NewsGator team as a product architect. NetNewsWire is a great product - would be terrific to see it on Windows. Silly name, good blog from the gang at IDC. There isn't a day that goes by on which advice for the PR profession pukes forth from the blogosphere like a broken New Orleans levy. (This in some part has to do with the people offering the advice deriving some - if not a large part - of their revenue/income from consulting to the PR industry). Shel via James over at Redmonk points to the needs for companies to not speak with one voice - I take this to mean "any message goes, say whatever you want, distribute whatever information you want". This is different though than speaking authentically and honestly. Sun is the master of speaking in many tongues but with one voice. Nobody wants to sound like a corporate drone. Nobody wants to be entirely repetitive. Everyone want to have their own twist. Any good communicator has been advocating this for years. There is no question that the odd critic from within creates a sense of authenticity (content + tone), but when this becomes a cacophony, you get the kind of perceptual meltdown Microsoft has been recently going through. So, I'm with you that authenticity matters. I don't agree with communications anarchy. We're running businesses with shareholders. Oh, and lets not confuse how perceptions are formed amongst the blogerati - we have a pretty academic view when it comes to brands vs. the mainstream buyer or user. It's very different in the 'real world'. Onto the rest of Shel's list then. He says "Listen, Really Listen" - yep, been advocating that for years. Unfortunately most listening by PR types is directed to executives and not customers and users. Just ask any agency what their listening/research budget is. His second and fourth points, "Feed the Bloggers" and "Be Transparent" are self evident. Yes. "Be Out Of Control", point #5 is one of those neat little phrases that gets bloggers all excited. It's just nonsense in the context of business; to which PR and communications are irrevocably connected. A business needs to be managed. It needs to be governed - both by its own policies and regulations. It is influenced by an aggressive competitive dynamic. And communications is part of a broader set of functions. So, communications needs to be controlled. I feel the same about #6 on Shel's list - "Facilitate, then be quiet". Research aside (plenty of other professions faired less well than PR), I don't buy that PR people shouldn't engage in dialog. To suggest this is to suggest that PR people are little more than meeting makers, devoid of content and intellect. Where Shel is right is that PR people shouldn't view themselves as gating and control points for conversations. In fact, the way for PR to build trust is for them to be outspoken. How they do it and what they say is a very different matter. So, I hope these comments are taken in the spirit in which they were given, as part of conversation. In a world of blogs, podcasts, video mash-ups, interactive maps, and so much more, the nature of corporate communications must change from top-down control to multi-directional openness - from lecture to conversation. If all that is daunting, however, keep in mind that the new options are available to the newsmakers and the PR people advising them, not just the bloggers. The way entry-level PR people and journalists deal with each other isn't a trivial matter; solid press relations are part of a smart PR strategy. But they are becoming less important than the way newsmakers - the people and institutions journalists cover - deal with various other constituencies. I love the idea of "multi-directional openness" - this is a far more powerful notion than that of "be out of control". Implicit in it is that those you have a conversation with are also going to be open. Are the media are for the same degree of transparency they seek from companies? "Blogs are all the rage, and I encourage their use as part of the external - and internal - communications process. Unlike press releases, which tend to read as if they'd been composed by the mating of a computer and lawyer, good blogs have a distinctly human voice. They are conversational almost by definition." So, maybe I am getting wrapped-up in semantics re: voice/message and tone. I don't think so though. As Dan says, we all have plenty to learn. A good little blog primer from PC Magazine.